Initial Remark: Reload this page if formulas don’t display well! As promised, here is the second part on how to obtain confidence intervals for fitted values obtained from nonlinear regression via nls or nlsLM (package ‘minpack.lm’).
. Using the “Delta method” for nonlinear confidence intervals in R has been discussed in http://thebiobucket.blogspot.de/2011/04/fit-sigmoid-curve-with-confidence.html or http://finzi.psych.upenn.edu/R/Rhelp02a/archive/42932.html. is the matrix trace (sum of diagonals). 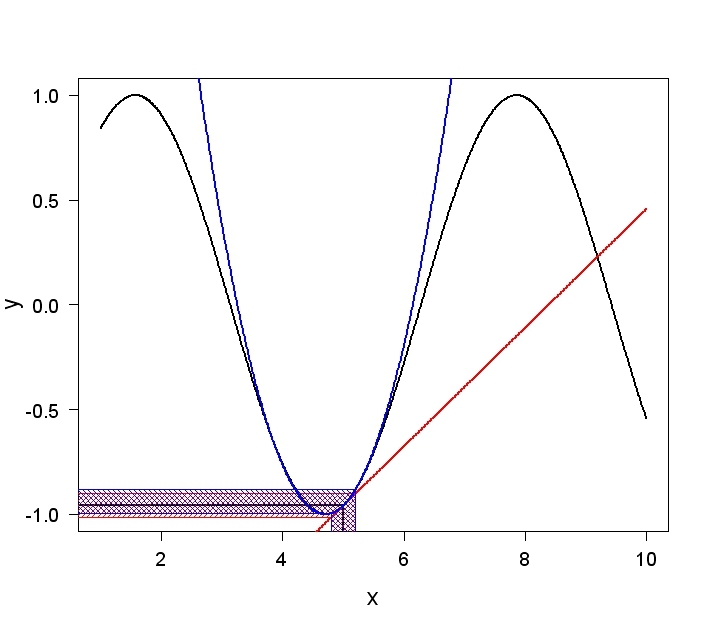 1) numGrad for calculating numerical first-order partial derivatives. 2) numHess for calculating numerical second-order partial derivatives. 1) and 2) are modified versions of the genD function in the “numDeriv” package that can handle expressions. The errors/confidence intervals are larger than with the MC approch (who knows why?) but it is very interesting to see how close the second-order corrected mean (1.243288) comes to the mean of the simulated values from the Monte Carlo approach (1.243293)!